I loved Disney when I was little. In fact, I still love it now and I can't wait for Little Guy to love it too! Luckily, Tollytots works with brands like Disney® and now our little ones can make some memories with the characters that we loved as children! Tollytots sparks imagination, creativity and helps children to create countless playtime memories with their extensive line of dolls, accessories and preschool collections. They have partnered with some of the most trusted and recognized brands in the world – including Fisher Price®, Graco® and, of course, Disney®. Children as young as 6 months develop pretend play skills by nurturing and interacting with their toys from Tollytots. We were sent My First Disney Price Eric for review. “Before he grew up and swept Princess Ariel off her fins, Prince Eric was an adventurous boy with a love of the sea! A royally fun companion for girls and boys alike, this young Prince Eric doll is so handsome in his finest outfit. He and Ariel will make all your magical playtime dreams come true." So, Little Mermaid was one of my ALL TIME FAVORITE Disney movies as a little girl. I absolutely LOVED this movie. I remember watching it over and over with my sister every day for at least a month! Actually, just the other day in the car we were listening to Pandora's Toddler Station and "Under the Sea" came on. Now, that song is a classic! Little Guy started giggling and laughing in his car seat, so I know he'll love Little Mermaid too when he gets old enough to watch it! Needless to say, I was very happy that this would be Little Guy's first doll- it was perfect! 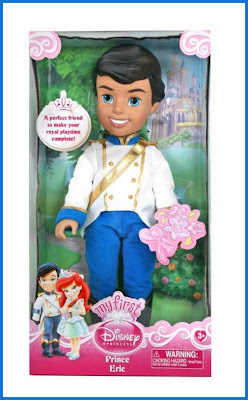 The My First Disney Prince Eric is an all plastic doll with movable limbs. It is approximately 15 inches high, and he comes wearing his signature prince outfit. The only small part he came with that may pose a problem for infants is the cardboard Sebastian crab prop, but it is easily removed. Little Guy liked playing with his Prince. He's just starting to figure out what dolls and stuffed animals are, giving them hugs and things, so he will grow into liking this toy even more as he gets older. My First Disney Prince Dolls come in Cinderella's Prince Charming, Little Mermaid's Prince Eric, and Rapunzel's Flynn Ryder. These My First Disney Prince dolls are the perfect companion to the My First Disney Princess dolls seen below. They make for a great playtime friend! They’re also a wonderful alternative to buying a My First Disney Princess doll if your little one wants to play with a Prince! TollyTots also sent Little Guy this super fun Safety First Cubikal Truck which he LOVES! They are the perfect first truck and the cubikals are all interchangeable with others in the line. Follow & Connect: You can Like Tollytots on Facebook and follow them on Twitter. Win It: Come back in September to enter to win your own My First Disney Prince Eric from Tollytots during the "One-derful" Birthday Bash! OMG the prince is adorable! My daughter has the Ariel doll would love to get her the matching prince. i love this doll..my daughter has TollyTots cars also that was sent from them she loves them.. This is absolutely adorable. I love that they are making Prince dolls to go with their Princess line. They have such cute little faces on them. How fun! My daughter would love to have Prince Charming to go with her Cinderella. I want all of these dolls! These are so cute and i love they have options for boys. My niece would love these cute little dolls. 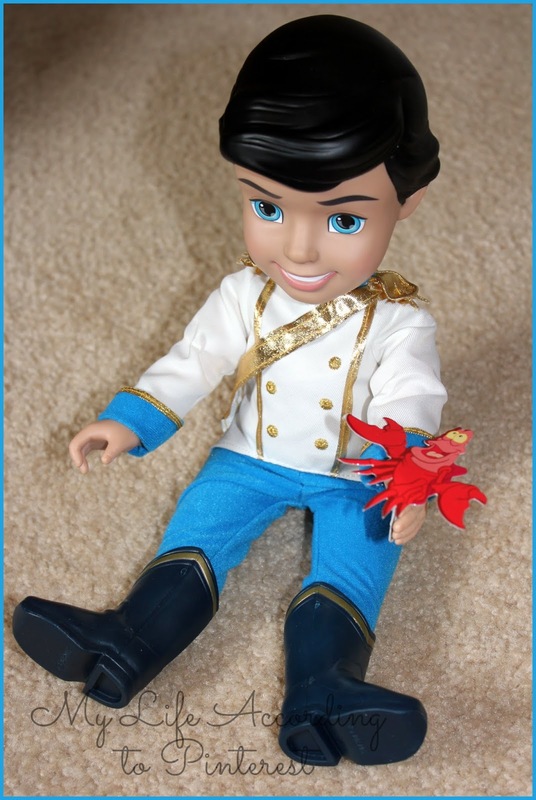 Prince Eric doll is so cute the kids loved the movie so I know the girls would love to add him to their collection too. Safety 1st Elite 80 Air Car Seat Giveaway! 2 Red Hens Rooster Diaper Bag Giveaway! Back to School Pinterest Party! Do some Back to School shopping at zulily.com! Dress up your little girl or guy with Gymboree!